At this time of year Holland, Michigan (USA) is already way too cold for me (Not to brag, but Taipei was in the high 70's yesterday). 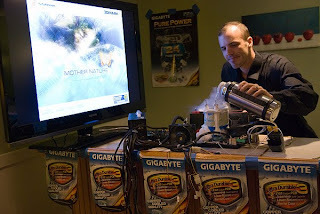 Overclocker Chew (aka Brian Mclachlan) and friends decided to make it even colder by ordering up some LN2 and dry ice in order to break some AMD overclocking records. Using the GIGABYTE GA-MA790FXT-UD5P motherboard, which is no stranger to the cold, several records fell. Check out their impressive scores and photos of the event. Did the cat do any benching as well? Why USB 3.0 is much faster than USB 2.0?